Directions: Take 1 to 2 capsules three times a day on an empty stomach. In three days, if desired benefit is not achieved, increase to 2 to 3 capsules three times a day. 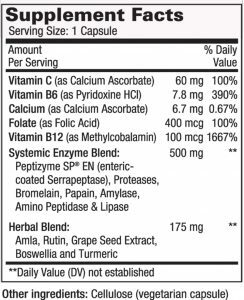 Take capsules at least 30 to 60 minutes before or 2 hours after a meal with 8 oz. of water. Store in cool, dry place with the lid tightly closed. Avoid excessive heat. Keep out of the reach of children.